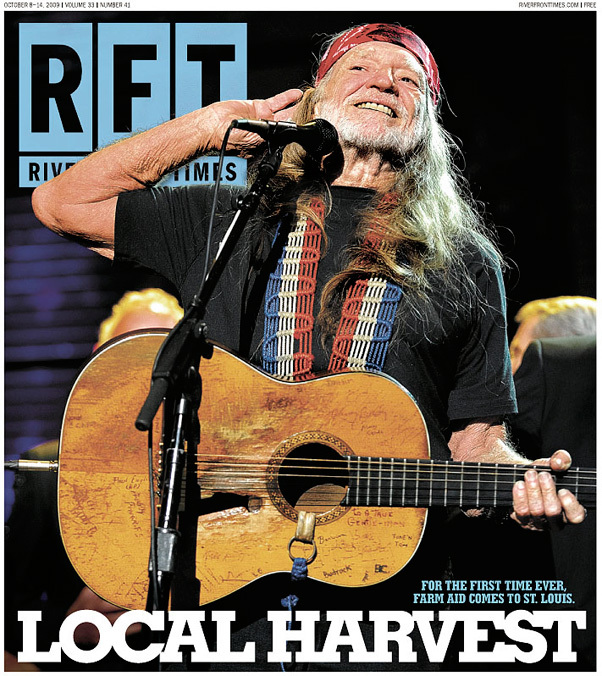 The cover of the October 8, 2009 Riverfront Times featuring my photo of Willie Nelson. The granddaddy himself, Willie Nelson, closed out Farm Aid 2009 in a blowout performance that had the crowds on their feet and singing along in the perfect end to the benefit concert. One assignment I had for Farm Aid 2009 was shooting the cover for the Riverfront Times (Village Voice Media), so one constant consideration I had during Willie Nelson's set at Farm Aid was delivering one killer shot of Willie that would work in the 10″ x 12″ format of the paper. For the first several songs during his main set, Willie Nelson wore a hat, which was later removed later on in the set. Surprisingly, the hat wasn't really an issue with regard to shadows on Willie's eyes, so the shoot was good throughout the performance. Just as for all the main acts, the photographers were split into two groups for Willie Nelson's set, with two songs allotted to each group. I was in group A and started out in the pit for the first two songs of the performance, after which group B shot for two songs. Toward the end of the show, before the “Circle of Friends” finale, all photographers were allowed back into the photo pit, so in total I probably photographed about 5-6 songs of Willie's set. A little over a third of the photo pit was taken up by the official Farm Aid photo team, so all photography for the general press was confined to the other side (house left) of the pit. As such, the space we could shoot from extended from stage right to just past the center of the stage. After seeing how Willie Nelson held his guitar during his one-song duet with Dave Matthews, I knew that I wanted to be on the right side of his microphone. This spot proved to be a solid bet, as I felt Nelson favored his left when performing, and I'd recommend this side to anyone having to choose a spot for him at an event like Farm Aid. Due to the number of photographers at Farm Aid, moving around was never a terribly enticing option, especially for the headlining acts. The lighting for Willie's set was pretty much just spotlights the entire time, and especially so during the finale when he was joined by a stage-full of friends to close out the night. Todd, I just wanted to say congratulations on yet another achievement. I love the RFT and from first glance at the cover, I knew that you were behind it. Thanks a lot for the support and kind words, always enjoy catching up with you at shows. As a country music concert photographer Willie is one that i have to photograph yet, Nice shots. When ever i photograph someone with a guitar i always try to get shots from the body of the guitar side so that the camera does not focus on the headstock. Doing a little research on you tube is good for that. Sometimes a fill flash is needed for those that wear a hat like willie often does especially in the small clubs i shoot in. Nice job, great detail! Thanks for the comment. I generally prefer to photograph with the headstock coming toward the camera, rather than away, but I shot from both sides at Farm Aid due to the lighting for the various acts. YouTube is always a good resource for bands one hasn’t shot, or for new tours, to check out the lighting. Grand shots Todd. I would love the experiance of meeting all those pro photogs in one place, especially at a show of this caliber. Thanks for the comment. Festivals and big shows like Farm Aid are always a good place to meet up with other photogs. There’s often enough down time and waiting around before each act that there’s plenty of opportunity to talk shop for those that are interested. Hope the concert was a blowout event. hey all, i’m a new coming concert photographer…. i shoot with a nikon d90… i’ve been thinking of looking into buying a better lens so i can zoom in a little more… can any of you suggest a lens/ flash i should consider buying? !